Art Gallery owner Peter Blake publicly announced on Saturday that he is running for City Council. His Intent To Run form was filed on Tuesday. Blake pulled no punches in his announcement. He doesn’t like the direction the city is going aesthetically, politically or commercially. “I see no one who is willing to address controversial issues the way I will,” said Blake, 53, a resident of Laguna since 1987. He declares himself beholden to none. Blake has opened two businesses in Laguna, a clothing store and his art gallery, originally on Gallery Row, now located on Ocean Avenue, but he owns neither building. He said his experience in the move to Ocean Avenue and experiences others have had in dealing with the Design Review Board leads him to the inescapable conclusion that the design review process should be revised. Although he believes the ballot is the way to limit terms of elected officials, he wants to see appointments to city committees, boards and commissions replaced after two terms – especially the Design Review Board and the Heritage Committee. “Who are these people who dictate what Laguna Beach architecture should look like?” said Blake. “We should be focusing on really special structures and not forcing people to be on a list they don’t want to be on,” referring to the proposals to revise the city’s Historic Preservation Ordinance, mired in discord. Blake’s objectives include enactment of strong enforcement of laws pertaining to panhandling, public nuisances, low-level crime, drug use, and trespassing. On the other hand, he urges aggressive legal representation against the ACLU. He considers the so-called “War Against Trees” to be a war against views and would take steps to strengthen the city’s view preservation ordinance. Blake said he would work to bring CVS into the downtown, a proposal he considers was mishandled. He would support closing Forest Avenue to vehicular traffic. “We don’t see people who paint idyllic pictures of Forest Avenue shopping there,” Blake said. And the South Laguna Community Garden wouldn’t get funding from him. “Not one penny for a garden for one percent of the population,” said Blake. Blake did not take a position on undergrounding, short-term lodging or accessory dwellings, all subjects likely to crop up at the forums. 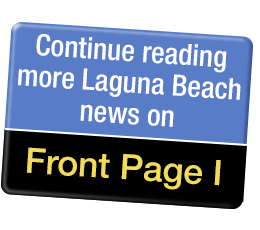 He plans to participate in all candidates’ forums, which should provide a lively debate in light of his positions on some of Laguna’s most sacred shibboleths. “By the time anyone votes for me, they will know exactly what they are getting,” said Blake. Over the weeks, Barbara Diamond will interview each and every candidate who files to run for City Council. She’ll also attend and report on at least one fundraising event per candidate as well as candidate forums.